The Time Machine: An Invention. 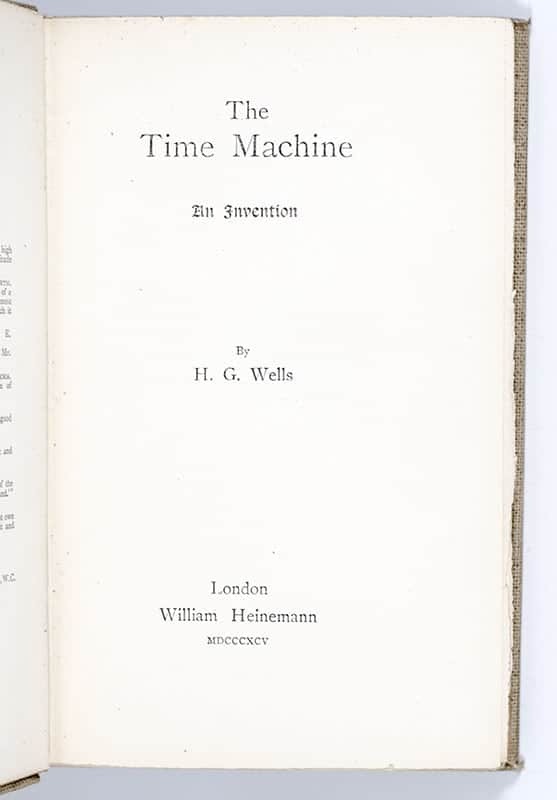 First English edition, first issue of Wells’ groundbreaking “scientific romance”- a work generally credited with the popularization of the concept of time travel by using a vehicle that allows an operator to travel purposely and selectively forwards or backwards in time. Octavo, original cloth, front panel and spine stamped in purple with sphinx vignette. In near fine condition. First issue with first priority sixteen-page publisher’s catalogue at end. Cover artist by Ben Hardy. 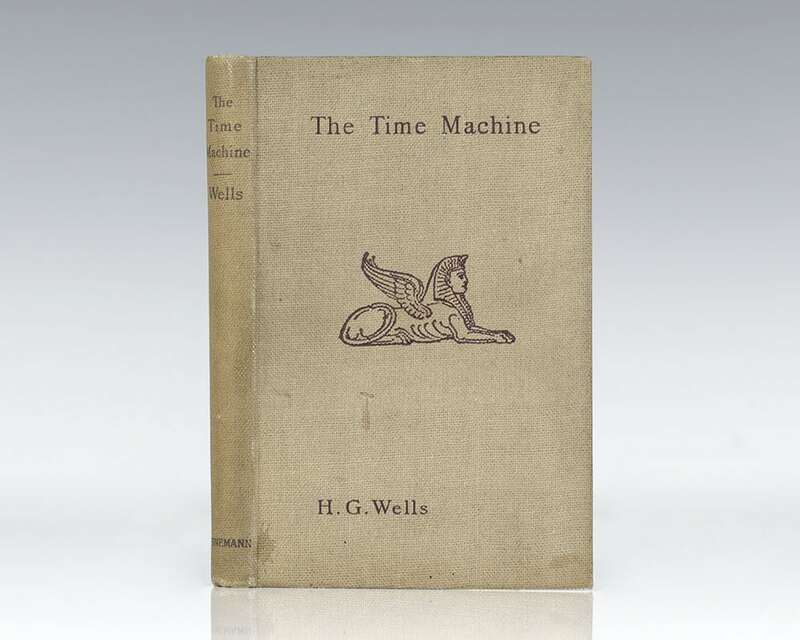 In 1894 Wells "began writing what he called 'single sitting stories' using his special knowledge of science, culminating in the publication of his novella The Time Machine in 1895… It was an immediate success" (Gunn, From Gilgamesh to Wells, 337). Its earliest readers grasped its significance: as one contemporary review states, "So far as our knowledge goes [Wells] has produced that rarity which Solomon declared to be not merely rare but non-existent—a 'new thing under the sun'" (Bergonzi, 41). Important not only for establishing Wells as a popular author but also for making a "crucial breakthrough in narrative technology, providing science fiction with one of its most significant facilitating devices" (Clute & Nicholls, 1227), "it is the most important foundation stone of British scientific romance and the science fiction genre in general" (Anatomy of Wonder II-1232). 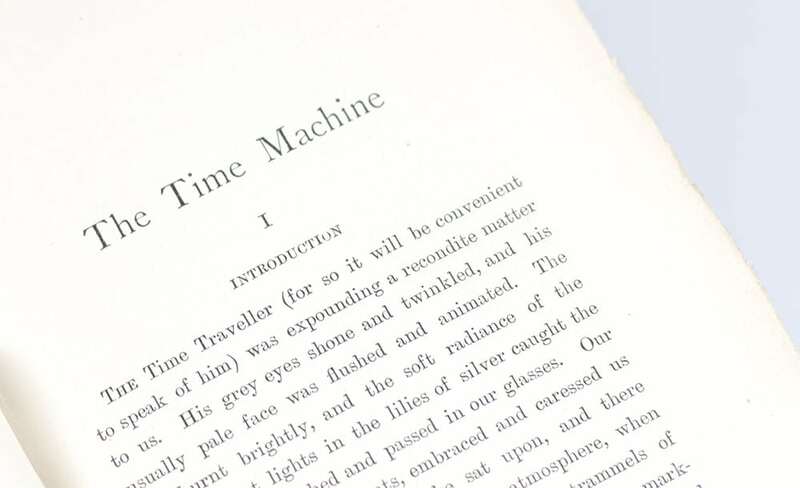 Indeed, "once it was published it modified and changed English and American fiction forever… Wells had produced a significant and seminal work… a masterful marriage of the fictive art and theoretical science" (Smith, 46, 50). It has been adapted into three feature films of the same name, as well as two television versions. New York: The Macmillan Company, 1922. 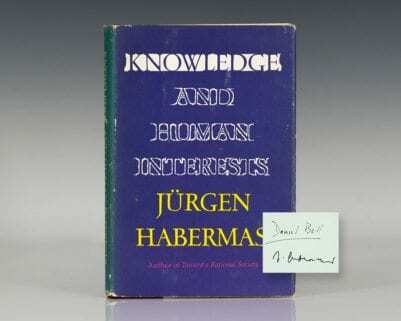 First edition if Wells’ classic work, which Albert Einstein recommended for the study of history as a means of interpreting progress in civilization. Octavo, original cloth. Boldly signed by H.G. Wells on the half-title page. In near fine condition. With an original pamphlet from the publisher laid in. First editions are uncommon, signed examples exceptionally so. The Country of the Blind and Other Stories. London: Thomas Nelson and Sons, 1911. 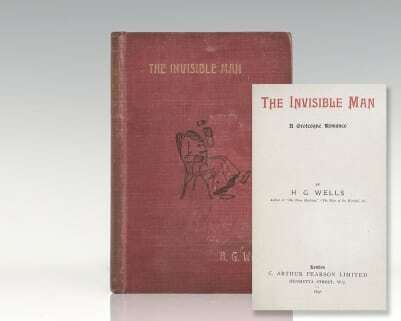 First edition of this classic collection of short stories featuring one of Wells’ best known tales, The Country of the Blind. Octavo, original blindstamped cloth, gilt titles to the spine, pictorial endpapers, engraved colored frontispiece. In very good condition, stamp to the title page. A very bright example. The Salvaging of Civilization: The Probable Future of Mankind. New York: The Macmillan Company, 1921. First American edition, which preceded the British edition of of this work which addresses the possibility of a future world state . Octavo, original cloth. Boldly signed by H.G. Wells on the half-title page. In near fine condition. London: Macmillan and Co, 1913. First edition of this novel, which was the first introduction of Wells’s notion of an “open conspiracy” of individuals to achieve a world state through an “open conspiracy against potentates and prejudices and all the separating powers of darkness.” Octavo, original green cloth, gilt titles to the spine, gilt topstain. 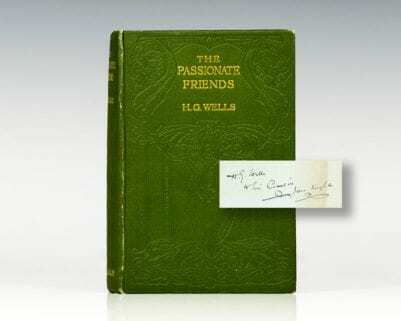 Inscribed by the author on the front free endpaper to his cousin, “H.G. Wells to his cousin Jane Knight.” Bookplate of Larry McMurtry on the front pastedown. In near fine condition with light offsetting to the endpapers. A nice association and with noted provenance. The Food of the Gods and How it Came to Earth. London: Macmillan and Co, 1904. First edition of Wells’ satiric utopian novel. Octavo, original blind-stamped green cloth, gilt titles to the spine and front panel. In near fine condition with light rubbing to the extremities. Tales of Space and Time. London: Harper & Brothers Publishers, 1900. First edition of this collection of three short stories and two novellas. Octavo, original cloth, with 2 pages publisher’s advertisements at end. Presentation copy, warmly inscribed by the author on the front free endpaper, “W.E. Henley with affectionate regards from H.G. Wells” along with an original drawing of Ugh-lomi and Eudena, the protagonists of A Story of the Stone Age, one of this volume’s five collected short stories. In very good condition with some toning to the spine. London: C. Arthur Pearson, 1897. First edition, first issue, with the title page printed in orange and black and pages 247 and 248 being publisher’s ads. Octavo, original cloth. In very good condition with some toning to the spine and wear to the extremities. The World Set Free: A Story of Mankind. London: Macmillan and Co., Limited, 1914. First edition, second printing, published the same month as the first. Octavo, original cloth, gilt titles to the spine and front panel, gilt topstain. Boldly signed by H.G. Wells on the dedication page. In near fine condition with light rubbing to the spine tips. Uncommon signed. Meanwhile (The Picture of a Lady). New York: George H. Doran Company, 1927. 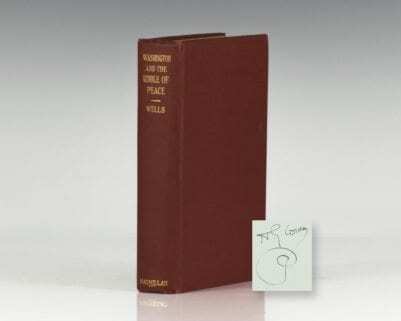 First American edition of Wells’ 1927 novel detailing a house-party Casa Terragena, an Italian villa with a famous garden on the Italian Riviera. Octavo, original cloth. Very good in the original dust jacket which is in good condition with some wear to the extremities. London: Cassell and Company, 1923. 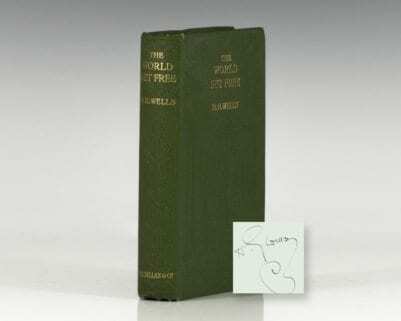 First edition of Wells’ utopian scientific fantasy. Octavo, original blind-stamped green cloth, gilt titles to the spine. Association copy, inscribed by the author on the half-title page, “H.G. to his Mother in law.” The recipient M.C. Robbins, was the mother of Wells’s second wife Jane. Near fine in the original dust jacket which shows a few small chips and wear to the extremities. An excellent association. The Undying Fire: A Contemporary Novel. New York: The Macmillan Company, 1919. 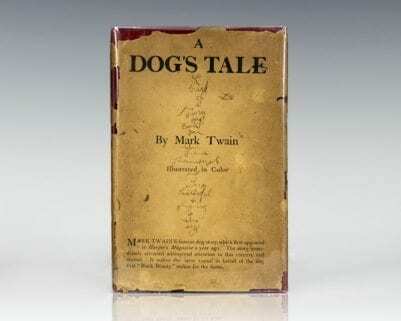 First edition of Wells’s modern retelling of the story of Job. Octavo, original cloth. Boldly signed by H.G. Wells on the half-title page. In very good condition with light rubbing. Washington and the Riddle of Peace. First edition. Octavo, original cloth, gilt titles to the spine. Boldly signed by H.G. Wells on the half-title page. In fine condition. Scarce and desirable signed. London: C. Arthur Pearson Limited, 1897.